Public Service Minister Elias Kapavore launches the Project Management and Financial Management courses in Ialibu-Pangia District. The Pacific Institute of Leadership and Governance is committed to the development of public service leaders by providing vocational training that meets the needs of government agencies. The Institute is focused on enhancing public sector performance, with a particular emphasis on the extension of programs to the subnational level through regional training centres, and delivery in the regions, provinces and districts. It provides organisational needs-based training focused on ethical leadership, strategic planning, corporate services and management processes. In the longer term, the Institute aims to be the premiere provider of choice for ethical training products and programs to the Pacific Island nations. It prepares civil servants to work capably and ethically by providing learning and development opportunities that are practical, relevant to the Papua New Guinea public sector and aligned with the Ethics and Values-Based Executive Leadership and Management Capability Framework, the Gender Equity and Social Inclusion Policy and the National Qualification Framework. Julien Sipo graduates with a Diploma of Government (Management). The Pacific Leadership and Governance Precinct supports the Institute’s continued revitalisation led by its management team. Regional training delivery is being strengthened, with assistance from the Precinct, including vocational education delivered directly to subnational areas. This supports the Government of Papua New Guinea’s decentralisation priority through the development of leaders who can drive improved service delivery and economic development at the provincial and district levels. The Precinct support includes strategic planning and management, a curriculum review process, improvements to the student management system, and information and communications technology upgrades – which will include an online dashboard for staff and student administration. A strong partnership with the Australian Public Service Commission has assisted with training, including the improvement of internal capacity to design and deliver courses. 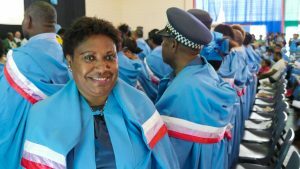 The Pacific Institute of Leadership and Governance has increased the number of graduates coming through its diplomas, certificates and courses. The Precinct is supporting the construction of new facilities befitting the country’s premiere school of government. Sir Sere Pitoi Rumana, the new administration building, is named in honour of Sir Sere Pitoi – who was one of the first Papua New Guineans to hold a top public service position. The connection with the first generation of national leaders is also reflected with the Bully Beef Wing and the Bully Beef Room, which are housed inside Sir Sere Pitoi Rumana. They recall the ‘Bully Beef Club’ of Papua New Guinean leaders who made a significant contribution to the intellectual discussion that preceded Papua New Guinea’s Independence. 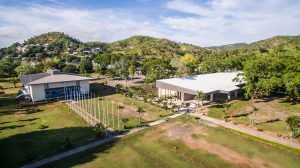 The Learning Resource Centre will replace the library, which was constructed in 1963 and gifted to the Councils of Papua and New Guinea by the local governments of Australia in 1966. It will be equipped with the latest information technology, including audio-visual stations and an internet café, and has been designed to be accessible to people with disabilities. 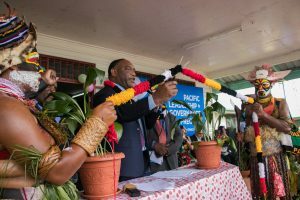 The Pacific Institute of Leadership and Governance has played an important role in the history of leadership development in Papua New Guinea and the Precinct is supporting this tradition to be continued.